AHALIQ (1977) The 187 ton 100 foot steel oil screw tug/barge Ahaliq foundered in rough seas June 29, 1977 in Bristol Bay, 118 miles southwest of Dillingham. She was carrying materials and equipment to build a sewage treatment plant for the village of Kwigillingok when she began taking on water. Because of low freeboard, some of her deck cargo became buoyant in heavy weather and caused damage to the deck allowing water to flood her tanks. The vessel’s captain, David Summerfield Moon (43) of Seattle, was lost with the ship. Four other crewmen boarded a lifeboat with a stray Border Collie they had picked up in Homer named Tippy and were rescued four days later. Their raft was spotted by a U S Coast Guard C-130 and crewmembers Daniel Adams, Tim Jenkins, Raymond Sharp and Gary Sherman were picked up by the Coast Guard cutter Boutwell. ALASCO (1952) The 22 ton 44 foot wooden gas screw fishing vessel Alasco foundered June 27, 1952 near Cordova. ALASCO 2 (1972) The 17 ton 43 foot wooden oil screw fishing vessel Alasco 2 foundered April 6, 1972 at David Island. ALASKA CONSTRUCTOR (1988) The 113 foot supply barge Alaska Constructor was consumed by fire November 2, 1988 off of Trading Bay in Upper Cook Inlet. A tank truck containing 3,000 gallons of gasoline caught fire on the deck of the barge and exploded. Lost were captain Stan Hanson (36) of Homer, engineer Bruce Babcock (34) of Anchor Point and Carl Anderson (58) fuel truck driver of Anchorage. First mate Stephen Hobbs survived by lowering himself by rope from the burning vessel and wading to shore. The Alaska Constructor was later towed to deeper water where it was sunk by a demolition team. ALASKA DAWN (1996) The 90 foot fishing vessel Alaska Dawn grounded and became a total loss October 5, 1996 on the north end of Andronica Island. The Alaska Dawn had arrived at Sand Point from the Bering Sea the afternoon of October 4, 1996. After taking fuel, water and having dinner, the crew departed the area around midnight. The captain took the first watch with a destination of Mitrofania Bay. Two hours later he slept through the bridge alarm and the vessel grounded on the north side of Andronica Island. Good Samaritan vessels Vardal and Exodus responded to the distressed vessel. The water level in the Alaska Dawn was a foot from the ceiling of the engine room when the crew abandoned ship. All four crewmembers of the Alaska Dawn were transported by the Vardal’s skiff to the Exodus and subsequently back to Sand Point. 7,000 gallons of fuel was removed from the Alaska Dawn before she was eventually scuttled. ALASKA MARINER (1980) The 86 foot power scow fishing vessel Alaska Mariner caught fire and sank November 3, 1980 near Sitkalidak Island. The crew was rescued by the fishing vessel Pacific Lady and a U S Coast Guard helicopter. ALASKA ROUGHNECK (1979) The 130 foot steel landing craft Alaska Roughneck foundered after running aground February 28, 1979 near King Cove. Lost were skipper Eugene Love and Dan Buarnard of Western Washington. Crewmen Bruce Campbell and Don Rude were picked up by the fishing vessel Seven Seas, transported to Cold Bay and airlifted by commercial jet to the hospital in Anchorage. The Alaska Roughneck was being chartered by Deep Sea Inc. of Seattle. Additional Information: Tonnage 198 Gross 135 Net, Length 113.5, Breadth 34, Depth 8, Built 1944 Houston TX, ON 288328, Former Name LSM 116 USN, SL WT3536, 1,000 HP, Owner Foss Launch and Tug Co.
ALASKA ROUSTABOUT (1962) The 119 ton 100 foot steel oil screw tug Alaska Roustabout foundered September 28, 1962 in the Gulf of Alaska. ALASKAN PRIDE (1993) The 120 foot steel oil screw crab fishing vessel Alaskan Pride flooded and sank February 7, 1993 90 miles northwest of Cape Sarichef, Unimak Island. All seven crewmembers were rescued by the F/V Brittany and transported to Dutch Harbor. ALASKAN WARRIOR (1982) The 52 foot fishing vessel Alaskan Warrior sank September 11, 1982 off of Dangerous Cape near Kodiak. The five on board were picked up by the vessels Miss Brenda and Abby Jo. The vessel left Juneau on August 13, 1892 and wrecked inside Harbor Point, Lituya Bay. The damage to the vessel (valued at $800) is reported as total, but the damage to the cargo is listed as only $100 of the $800 worth on board. ALBATROSS (1964) The 73 ton 60 foot wooden oil screw fishing vessel Albatross was reported lost in the Good Friday earthquake of March 27, 1964 at Kodiak. The vessel’s value was listed as $4,400 with no cargo and 8 tons ballast. Additional Information: Vessel rebuilt in 1883, Registration San Francisco March 25, 1891, ON 94, Master Charles Avery of Kodiak, Owners Julius & Lawrence Christiansen, Crew 5, Loss total, Insurance $4,000. The report indicates that there was no cargo aboard, but the vessel herself, worth $15,000, was a total loss. Additional Information: Tonnage 47 Gross 36 Net, Built 1926, Registration Cordova, ON 225644, Owner Alden Boat Co. Latouche, Alaska. Additional Information: Vessel Construction wood sloop, Tonnage 8.92 Gross 6 Net, Age 29 years, Registration Juneau, ON 197137, Owner T.O. Perry of Seldovia, Master same, Last sailing Juneau September 24, 1922. ALERT (1985) The 94 foot steel fishing vessel Alert disappeared with all hands February 14, 1985 near Bumble Bay in the Shelikof Strait. The vessel was mid-water trawling for Pollack in the Shelikof Strait with several other vessels when the wind and tide direction shifted simultaneously causing a rapid increase in wind and wave height accompanied by a substantial decrease in temperature. The Alert was last seen making heavy ice and was reported heading toward Bumble Bay on the southwest side of Kodiak Island. All that was found during an intense search in the days that followed was a slight oil slick in the area where the Alert was last reported. Lost with the Alert were her skipper and owner Mel Wick (42) of Kodiak, Sean T Heaney (25) of Kodiak, Ray Basel (42) of Kodiak, Paul Rowe (18) of Ballard and Svernin Ben-Adalsteinson (42) of Edmonds. Comments: This wreck has recently been located and dive tours are being offered. Additional Information: Tonnage 5708 Gross 3510 Net, Built 1898, Registration New York, ON 96435, Master J G Nord of Seattle, Last Port Zachar Bay, Destination Uyak Bay. ALEUTIAN (1957) The 57 ton 62 foot wooden oil screw fishing vessel Aleutian was destroyed by a storm July 16, 1957 on Chiniak Rock, Kodiak. ALEUTIAN (2000) The 31 foot fiberglass salmon fishing vessel Aleutian took on water from a leaking shaft packing, grounded and was lost June 15, 2000 at the mouth of the Naknek River. All four crewmembers were rescued by the fishing vessel Sockeye. ALEUTIAN I (1960) The 12 ton 29 foot steel oil screw fishing vessel Aleutian I collided with an unidentified object and sank April 10, 1960 in King Cove. ALEUTIAN REEFER (1967) The 125 foot wooden oil screw fishing vessel Aleutian Reefer burned at Homer March 29, 1967. ALEXANDER (1906) On August 18, 1906 the steam whaling bark Alexander was wrecked at Chugak while bound for a whaling voyage. She was built in New York in 1855 as the Astoria and previously operated under Russian ownership in the North Pacific prior to the purchase of Alaska by the United States. Comment: Safeguard the Gateways maps this wreck at Shuyak Island which is where I have mapped it. Additional Information: Tonnage 294, Owner Liebes and Co.
ALEXANDER (1925) On the night of December 1, 1925 during a severe storm at Seldovia, the vessel Alexander drug anchor and became a total loss. The master and owner, J R Smith of Seldovia and one other crewman aboard escaped unharmed. Additional Information: Tonnage 13 Gross, Age 15 years, Registration Seattle, ON 204301, Vessel value $1,000, Cargo none. ALEXANDRA (1897) At 1:00 p.m. on December 22, 1897 during a stormy NW gale the American wood schooner Alexandra drug anchor and became a total loss. The casualty occurred at Goose Island (one of the Geese Islands at the SW end of Kodiak Island) where the vessel had been out of commission for two years. The three crewmembers responsible for the vessel escaped without injury. Comments: H W McCurdy has this wreck listed the same day the same place one year later with 10 men lost. Goose Island is more commonly called Aiaktalik Island. Additional Information: Tonnage 7.66, Registration Kodiak, ON 106422, Owner and Master A C Brown of Kodiak, Value $800, Length 35.6, Breadth 11.3, Depth 4.1, Built 1886 at Kodiak. ALEXANDRIA C (1999) The 56 foot salmon fishing vessel Alexandria C was consumed by an engine room fire and lost September 19, 1999 at Old Harbor. The vessel had just arrived from fishing off the south end of Kodiak and tied to other vessels on the pier when smoke was detected coming from the engine room. Upon examination by Ken Christiansen, a crewmember, a fire appeared to be located on or below the port engine. The Alexandria C was quickly towed by skiff away from the other vessels and beached while attempts were made to extinguish the blaze. She burned to the waterline and became a total loss. ALF AND JIM (1961) The 12 ton 34 foot wooden gas screw fishing vessel Alf and Jim was destroyed by fire September 12, 1961 at Port Wakefield. Comment: There was a reduction and saltery plant named Port Wakefield reported in 1952 by the USGS on the east coast of Raspberry Island at the above coordinates. It was later moved to the west side of Kizhuyak Bay after being partially destroyed by the earthquake and title wave of March 1964. ALFA (1907) The 5 ton 30 foot sloop Alfa stranded and was lost at Ugashik November 28, 1907. The two persons aboard made it to safety. ALFE (1929) At about 1:00 a.m. on March 6, 1929 the gas screw Alfe (or Alf E) broke her moorings at Steve Gee anchorage in Yakutat Bay and was a total wreck when found the following morning. J Frank Wright of Anacortes, Washington, who filed the wreck report in Seattle on October 21 of the same year, says the vessel was scheduled to sail the day of March 6th with Jens Hansen as master and four other crew, bound for Dry Bay. The casualty is reported to have happened at Point Carrew, Yakutat Bay completely destroying the $3,000 vessel. Additional Information: Tonnage 11 Gross 9 Net, Age 11 years, Registration Seattle, ON 216439, Insurance $2,000, Cargo none. ALICE (1894) At 3:00 a.m. on July 10, 1894 the wooden schooner rigged vessel Alice parted her hawser in a heavy south westerly sea and drifted ashore at Anchor Point. The master and crew of the schooner Ettie assisted the three crew of the Alice, but she became a total loss none the less. She had departed Sitka, with her master John D Boland of Seattle at the helm, on June 13th bound for Cook Inlet with a stop at Kodiak. No lives were lost but the vessel, valued at $1,200, was. There was no cargo on board at the time. ALICE (1936) On July 7, 1936 the 31 ton fishing steamer Alice burned while on the ways at Bristol Bay and became a total loss. ALICE (1940) The 23 ton wooden gas screw fishing vessel Alice was destroyed by fire at Saint Ivan Harbor in Pavlof Bay July 4, 1940. The six crewmen made it to safety. ALICE B (1929) In March of 1929 the halibut schooner Alice B was driven ashore at West Bay and lost. The vessel valued at $10,000 and her 250 ton cargo of fishing gear, salt fish, salt, and supplies, valued at $12,000 were both a total loss. ALICE KAY (1986) The 36 foot vessel Alice Kay burned and sank July 19, 1986 off of Cape Unalishagvak. All persons on board were rescued. ALICE M (1996) The 29 foot salmon gillnet fishing vessel Alice M burned and sank August 7, 1996 in Nushagak Bay. The one person on board made it to safety. ALICE T (1952) The 131 ton 107 foot wooden oil screw vessel Alice T stranded and was lost August 5, 1952 on the northwest corner of Perl Island in Chugach Passage. ALLEN A (1919) On the morning of April 3, 1919, while moored at Baranoff, Unga Island, the three masted schooner Allen A broke her lines during a hurricane and was thrown 30 feet up on the beach, becoming a constructive total loss. What cargo was aboard was discharged except for salt which accounted for an additional $900 loss. The schooner at the time was valued at $20,000 according to A Greenbaum of Alaska Codfish Company, the managing owner, who filed the accident report at San Francisco on June 17. Additional Information: Tonnage 342 Gross 266 Net, Age 31 years, Registration San Francisco, ON 106521, Master Louis Hanson of San Francisco, Last sailing November 2, 1918 from San Francisco, Crew 9. ALLIANCE (1985) The 63 foot fishing tender Alliance exploded and sank July 12, 1985 near Axel Lind Island in Prince William Sound. The Alliance was refueling the fishing vessel Dawn L which also exploded and sank. The seven persons aboard the two vessels all survived. The Alliance was later salvaged. ALLIANCE (2005) The 93 foot fish tender Alliance struck a rock and sank in 50 fathoms of water at 1:40 a.m. August 26, 2005 at Cape Resurrection on the north side of Barwell Island. There were six persons on board including four adults and two children. The vessel was loaded with 244,000 pounds of king salmon from Prince William Sound. All six aboard abandoned ship to a skiff and were picked up by the Good Samaritan Vessel Black Velvet. They were transferred to a U S Coast Guard Auxiliary vessel and transported to safety. The disaster was attributed to the skipper sleeping at the wheel. ALMA (1964) The 118 ton 87 foot wooden oil screw fishing vessel Alma was destroyed by fire March 1, 1964 about 20 miles southeast of Long Island in Chiniak Bay. ALMEDA (1964) The 34 foot wooden gas screw fishing vessel Almeda was destroyed by the earthquake tidal wave of March 27, 1964 at Seward. ALMIGHTY (1991) The 144 ton 85 foot trawler Almighty struck a submerged object and sank May 28, 1991 approximately two miles off shore from Right Hand Point and seven miles north of Round Island in Bristol Bay. All five crewmembers were rescued by a nearby fishing vessel. The U S Coast Guard and U S Army Corps of Engineers attempted to mitigate the damage to the walrus sanctuary and herring hatchery close by. The vessel was eventually salvaged. Evidence of the wreck may still be on site and of interest. ALOHA (1901) The steamer Aloha became a total loss at the S.E. tip of Hinchinbrook Island In 1901. The vessel was 445 Gross tons, 216 Net tons and valued at $50,000. Additional Information: Tonnage 26.28, Built 1867 at Westport Oregon, Registration Sitka, ON 105761, Owner Jeff J Kuchun of Sitka, Length 52.6, Breadth 18.4, Depth 4.6. ALSKA (1999) The 63 foot steel long line cod fishing vessel Alska capsized in severe weather and sank March 12, 1999 in Hallo Bay on the Alaska Peninsula west of Kodiak Island. A U S Coast Guard Helicopter was able to rescue three of the crewmembers. A fourth was taken aboard the fishing vessel T-Mike. There was no loss of life. Additional Information: Tonnage 5.5, Age 11 years, Registration Juneau, ON 107290, Vessel value $650, Cargo ballast. ALTON (1898) On May 27, 1898 the 84 ton schooner Alton was lost in a gale near the mouth of Cook Inlet. She was leaving Cook Inlet bound for Tacoma with a crew of five. AMBITION (1996) The 83 foot steel fishing vessel Ambition departed Dutch Harbor February 5, 1996 for a Cod opening in the Bering Sea but was forced to lay up in Akutan Bay for weather. On February 7, 1996 the Ambition and Lone Star departed Akutan for the fishing grounds. While transiting Unimak Pass near Akun Island February 7, 1996, the trawler Ambition experienced a starboard roll, began to settle by the stern and did not recover. The five crewmembers donned survival suits and abandoned ship after issuing a May-Day. They were rescued by the fishing vessel Lone Star and transported to Dutch Harbor. It was less than ten minutes from the time a problem became evident until the vessel sunk. The Ambition had required U S Coast Guard rescue two other times during the past year. AMERICAN STAR (2000) The 154 foot steel crab fishing vessel American Star experienced an intense engine room fire February 11, 2000 and the crew was forced to abandon ship. All five crewmembers and a dog were airlifted to safety by a U S Coast Guard Helicopter from the Coast Guard cutter Mellon. The vessel eventually drifted ashore and stranded two miles east of Cape Lazaref on Unimak Island and became a total loss. The fire damaged the engine room and destroyed the pilot house. Comment: Many months later the salvage vessel Redeemer was enlisted to tow the hulk of the American Star out to sea where she was cut up and sunk in deep water. AMERICAN WAY (2009) The 38 foot fishing vessel American Way lost propulsion and ran up on the rocks January 4, 2009 at Aghiyuk Island southwest of Kodiak Island on the north end of the Semidi Islands. Both crewmembers abandoned ship in a life raft and landed on Aghiyuk Island. A Coast Guard HH-60 was dispatched from Kodiak and the crewmen were rescued in 58 mile an hour winds and driving snow along a rocky shoreline next to 300 foot cliffs. Commander Shawn Tripp, aircraft commander, Lt. David McCown, pilot, Aviation Maintenance Technician 1st Class Dennis Dewinter, flight mechanic and Aviation Survival Technician 2nd Class Eric Stoecker, rescue swimmer all received the American Helicopter Society’s prestigious William J Kossler Award for their heroism in the rescue. The American Way broke up on the rocky shore in the high wind and surf and subsequently sank. AMOOK (1963) The 29 ton 51 foot wooden oil screw fishing vessel Amook stranded and was lost February 5, 1963 at Anchorage Bay, Chignik. ANDREA MARIE (1998) The 39 foot vessel Andrea Marie caught fire and was abandoned December 22, 1998 near Kodiak. ANDROMEDA (2008) The 34 foot salmon gillnetter Andromeda foundered June 5, 2008 near False Pass at Bechevin Bay. The vessel was traveling from Port Moller and scheduled to rendezvous with two other vessels in False Pass but never showed. A search by U S Coast Guard Helicopter found the two crewmen from the vessel on the beach near False Pass still wearing survival suits. They were transported to Cold Bay and treated for mild hypothermia. The Andromeda issued a May-Day when it was experiencing engine room flooding on June 4, 2008 but was able to get the problem under control and the May-Day was cancelled. While on her way to rendezvous with another vessel in False Pass, the Andromeda was struck by a wave and began sinking. The two crewmen swam ashore in survival suits as the vessel sank. ANGARA (1989) The 42 foot crab fishing vessel Angara overturned December 9, 1989 off of Shuyak Island in the Shelikof Strait. Both crewmembers were lost including Ignaty Andreeff (48) and Vasily Andreeff (15). There was no life raft aboard the vessel. ANGEL MARIE (1979) The shrimp boat Angel Marie was blown onto the rocks and broke up October 8, 1979 in Chugach Bay on the south coast of the Kenai Peninsula. The two crewmembers swam to shore and made their way back to Seldovia. It was a 60 to 70 mile trek through rugged terrain, but they made it in less than three days. ANGELA B (1998) The 30 foot gillnet salmon fishing vessel Angela B burned from an engine room fire and was lost June 16, 1998 in Bristol Bay. All three crewmembers made it to safety. ANGLO SAXON (1905) On November 4, 1905 the 46 foot wooden gas screw steamer Anglo Saxon stranded at Chiniak on Kodiak Island and became a total loss. The two men on board were lost with the vessel. ANITA (1898) The steamer Anita was reported lost during 1898 in Cook Inlet and was valued at $1,000 with cargo. ANN (1952) The 17 ton 37 foot wooden gas screw fishing vessel Ann was consumed by fire November 5, 1952 while moored at Latouche. ANN PAGE (1976) The fishing vessel Ann Page struck a rock and sank August 3, 1976 south of Wingham Island near Cordova. 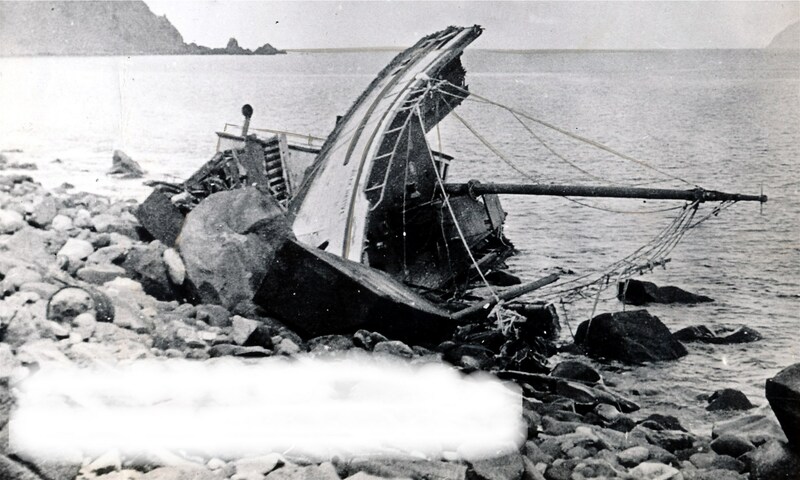 ANNA (1901) At 6:30 in the morning on Sunday March 3, 1901 the American schooner Anna was blown ashore and wrecked during a strong northeasterly storm at Company Harbor on the western end of Sanak Island. Harry Huhs, the vessel’s master, reported the winds at daybreak were at about 70 miles an hour, and even with two anchors out he was unable to prevent the vessel from drifting ashore. The Anna had departed Unga on February 9th with a crew of 8, and at the time of the casualty had 180 tons of codfish aboard, valued at $20,000. All crew were saved, but the vessel, valued at $12,000 and her cargo were a total loss. Additional Information: Tonnage 227, Built 1881 in San Francisco, Registration San Francisco, ON 105987, Owner Pacific Marine Supply of San Francisco, Insurance $9,000, Length 117, Breadth 29.5, Depth 10.6. ANNA C (1964) The 13 ton 31 foot wooden oil screw fishing vessel Anna C was destroyed by a tidal wave March 27, 1964 at Kodiak. ANNA D (1963) The 169 ton 96 foot wooden diesel powered Kodiak fishing vessel Anna D foundered at False Pass June 6, 1963. ANNA J (1926) The 28 ton 46 foot wooden gas screw halibut fishing vessel Anna J was severely damaged in a storm March 10, 1926. The vessel was hove to in heavy weather 60 miles off of Yakutat when a large wave completely cleared the deck. The cook was on watch and was washed overboard with the pilothouse and everything above deck, including the fishing gear, masts and lifeboat. The captain and the other 5 members of the crew managed to get a line to him and get him back aboard what was left of the Anna J. They limped to Cape Saint Elias and were assisted to Cordova by the halibut boat Superior. ANNA LEE (1974) The barge Anna Lee foundered in a storm May 12, 1974 in Kennedy Entrance below Cook Inlet. The tug Knik Wind, which was aboard the Anna Lee, was lost with the barge but salvaged sometime later. The barge and the rest of her cargo were lost. ANNA MARIE (1985) The 42 foot fishing vessel Anna Marie burned August 21, 1985 near Chignik. All persons aboard were rescued. ANNA O (1964) The 12 ton 37 foot wooden gas screw fishing vessel Anna O was destroyed by a tidal wave March 27, 1964 at Chenega. ANNA O (1985) The 36 foot wooden seiner Anna O grounded and was lost while towing the 26 foot gillnet fishing vessel Head and Tails May 16, 1985 at Softuk Bar in Controller Bay. Owner of both vessels, Robert I. Gill, was lost along with the Anna O. The Head and Tails was found and returned the family of Mr. Gill. Gill had intended to use the Head and Tails as a catcher boat and the larger Anna O as his bunkhouse. ANNA T (1997) The 27 foot salmon seiner Anna T was consumed by fire and sank October 13, 1997 in Prince William Sound. The only person on board made it to safety. ANNADELL (1964) The 163 ton 82 foot wooden oil screw vessel AnnAdell was destroyed by a tidal wave March 27, 1964 at Seward. ANNIE MAY (1895) The wood steam launch Annie May became a total loss including $1,300 worth of cargo July 7, 1895 at Cape Karluk in the same storm that destroyed the ship Raphael. Both vessels were driven onto the beach and destroyed by severe winds. The Annie May was owned by Alaska Packers Association and was being used as a tender. ANSONIA (1955) The 50 ton 63 foot wooden oil screw fishing vessel Ansonia struck a rock and sank in Uyak Bay July 23, 1955. ANTONE (1943) The gas boat Antone broke her rudder, went ashore and became a total lost December 24, 1943 a mile and a half south of Barabara Point. All 13 persons on board made it to shore and took shelter in the barabara on Barabara Point north of Seldovia. APA 9 (1986) The 32 foot vessel APA 9 was destroyed on the beach at Kalsin Bay in November of 1986. APEX NO 1 (1963) The 19 ton 42 foot wooden oil screw fishing vessel Apex No 1 stranded and was lost September 25, 1963 off of the Trinity Islands near Kodiak Island. APEX NO 2 (1933) The 22 ton 38 foot wooden gas screw fishing vessel Apex No 2 stranded and was lost at Near Island May 19, 1933. The one person aboard made it to safety. AR 1 (1966) The 8 ton 28 foot wooden gas screw fishing vessel AR 1 was consumed by fire August 2, 1966 at Koggiung in Bristol Bay. AR 5 (1966) The 8 ton 28 foot wooden gas screw fishing vessel AR 5 was consumed by fire August 2, 1966 at Koggiung in Bristol Bay. AR 7 (1966) The 8 ton 28 foot wooden gas screw fishing vessel AR 7 was consumed by fire August 2, 1966 at Koggiung in Bristol Bay. AR 8 (1966) The 8 ton 28 foot wooden gas screw fishing vessel AR 8 was consumed by fire August 2, 1966 at Koggiung in Bristol Bay. AR 9 (1966) The 8 ton 28 foot wooden gas screw fishing vessel AR 9 was consumed by fire August 2, 1966 at Koggiung in Bristol Bay. ARCATA (1942) The 2,722 ton United States Army transport ship Arcata was shelled and sunk by Japanese submarine I-7 July 14, 1942 approximately 165 miles southeast of Sand Point. Seven of the 29 man crew of the Arcata were lost. ARCTIC (1958) The 8 ton 30 foot wooden gas screw fishing vessel Arctic foundered June 17, 1958 approximately 18 miles west of Port Moller. ARCTIC II (1988) The 115 foot trawler Arctic II struck a large wave, capsized and sank December 10, 1988 approximately 55 miles north of Unimak Pass. All five crewmembers made it into a life raft but another large wave swept two crewmen back into the sea. The other three were rescued from their raft by the fishing vessel American Beauty. Lost were captain Stan Michna (33) and Gary Heeney (29). ARCTIC CHIEF (1950) The 775 ton 149 foot steel scow Arctic Chief stranded and was lost December 7, 1950 east of Marmot Island in the Gulf of Alaska. ARCTIC DREAM (1993) The 50 foot vessel Arctic Dream ran aground and was destroyed September 18, 1993 in Onion Bay during a hunting charter. ARCTIC MIST (1985) The 91 foot fishing vessel Arctic Mist rolled over and sank May 13, 1985 in the Gulf of Alaska 75 miles east of Kodiak. All four persons aboard were rescued. ARCTIC SEA (1972) The 57 ton 50 foot steel oil screw Arctic Sea foundered December 19, 1972 in Prince William Sound. Comment: A crab fishing vessel of the same name was reported stranded on a reef near Fairmount Island on January 18, 1971. ARCTIC WIND (1979) The fishing vessel Arctic Wind sank in the Bering Sea December 19, 1979. Comment: This must be the 117 foot Arctic Wind (ON 608216) that is still fishing. She appears to have been on the bottom of Kalekta Bay, Unalaska Island for six months before being salvaged and put back into service. ARDEA (1985) The 38 foot vessel Ardea drug anchor and grounded January 6, 1985 at King Cove on Afognak Island. The crew escaped to safety but the Ardea was destroyed. ARGO (1998) The 50 foot longline halibut fishing vessel Argo was consumed by a galley stack fire and lost July 31, 1998 approximately 15 miles outside of Dutch Harbor. Both crewmembers donned survival suits and abandoned ship. The U S Coast Guard cutter Storis arrived on scene to see an explosion blow the deck off of the vessel. The Storis sank what was left of the Argo as a hazard to navigation. There was no loss of life. ARMERIA (1912) In the middle of May 1912, the 1,502 ton United States Lighthouse Service Tender Armeria became stranded on the rocks near Cape Hinchinbrook. She was attempting to rescue the barge Haydn Brown but ended up a casualty herself. The crew of 36 was rescued by the steamer Admiral Sampson. The vessel, valued at $344,000, became a total loss. Some of the $70,000 cargo of coal, buoys and supplies for area lighthouses was salvaged. Comment: It is reported that divers have discovered this wreck. Sources: 1. The H W McCurdy Marine History of the Pacific Northwest (1966) Pg 211, 2. Safeguard the Gateways of Alaska (1918) Map. ARNE (1983) The 56 foot longline fishing vessel Arne ran aground October 10, 1983 just north of Narrow Cape. The vessel was destroyed by the surf. No lives were lost. ARNOLD (1915) On July 31, 1915 the 44 ton 57 foot gas screw fishing boat Arnold was consumed by fire at Anchorage. ARROW (1964) The 22 ton 46 foot wooden oil screw fishing vessel Arrow burned April 10, 1964 at Kodiak. ARTHUR (1921) On November 14, 1921 the wood scow Arthur was deemed to be unsafe because of a rotten hull and dismantled at Alitak Bay on the south end of Kodiak Island. She was owned by Alitak Packing Company at the time and valued at $800. Additional Information: Tonnage 47, Built 1901, Registered Seattle. ASTROLABE yawl (1786) During the voyage of exploration and scientific circumnavigation of the globe by French explorer LaPerouse in the vessels Astrolabe and Boussole, a small yawl was launched and subsequently lost with 11 crew at the mouth of Lituya Bay along the NE coast of the Gulf of Alaska in 1786. ATLANTOS (1999) The 38 foot fiberglass longline cod fishing vessel Atlantos capsized and sank due to icing January 30, 1999 south of Pilot Rock in Blying Sound. All three crewmembers were rescued by the fishing vessels Dolphin and Iceberg. ATTU (1990) The 65 foot wooden longline fishing schooner Attu grounded, was holed and sank March 29, 1990 at Kayak Island. All seven crewmembers were rescued. AUDREY V (1963) The 18 ton 40 foot wooden gas screw fishing vessel Audrey V foundered November 24, 1963 off of Cape Chiniak. The vessel was under tow by the U S Coast Guard cutter Bittersweet when she capsized. The Audrey V had caught line in her propeller and was unable to make way herself. While in tow, the weather increased to 70 mile an hour winds and 20 foot seas, which caused the small vessel to flip. Mike Smith and Jerry Williams were aboard the Audrey V when she capsized and sank. Jerry Williams was rescued but Mike Smith was lost. AUK (1947) The 28 ton 60 foot wooden gas screw tug Auk stranded and was lost October 16, 1947 at the mouth of the Ugashik River. AUKAI (1974) The Tolly craft fishing vessel Aukai ran aground and was lost April 4, 1974 on Kayak Island in the Gulf of Alaska. AUNT BERGIT (1996) The 38 foot fishing vessel Aunt Bergit was destroyed by a stack fire November 15, 1996 at Hinchinbrook Island. All three crewmembers made it to safety. AVONA (1954) The 15 ton 36 foot wooden gas screw fishing vessel Avona foundered September 21, 1954 northwest of Hive Island at the entrance to Resurrection Bay. AVOS (1808) The Russian Company tender Avos was lost in 1808 in Bay of Islands on her way from Kodiak to Sitka. Comment: I have mapped this wreck at Bay of Isles on Knight Island because out of the several possibilities for “Bay of Islands”, this anchorage is one commonly used as a safe haven by small vessels during storms in the Gulf of Alaska and the Avos was travelling between Kodiak and Sitka through the area. There is good holding ground in the south and west arms but caution must be used to avoid the many rocks and pinnacles entering the bay. The tall mountains that surround it give protection from almost all directions of wind. It didn’t get its official name until 100 years after this casualty occurred but locals called it the Bay of Islands or Bay of Isles for many years.